Nothing inspires like having a chic office space. I have rounded up some of my current favorite items. Let's start with the gorgeous black and gold desk. Add an acrylic Z Chair and a gold desk lamp for the ultimate work station. You need an etagere for all those books, files and trinkets, so why not make it the most glam bookcase like this acrylic and gold etagere? This sensational gold and acrylic tray can help keep you organized and this small black table can look cute underneath the desk holding a few more office necessities. The windowpane ottoman has the chicest fabric and would be ideal in a nearby corner. I'm in love with the acrylic pencil and note holder. The gold magazine rack is sensational to display the latest Elle Decors. I personally love handwritten notes and am completely obsessed with these adorable note cards with their fun liners (pink, marble, and Que Sera, Sera). 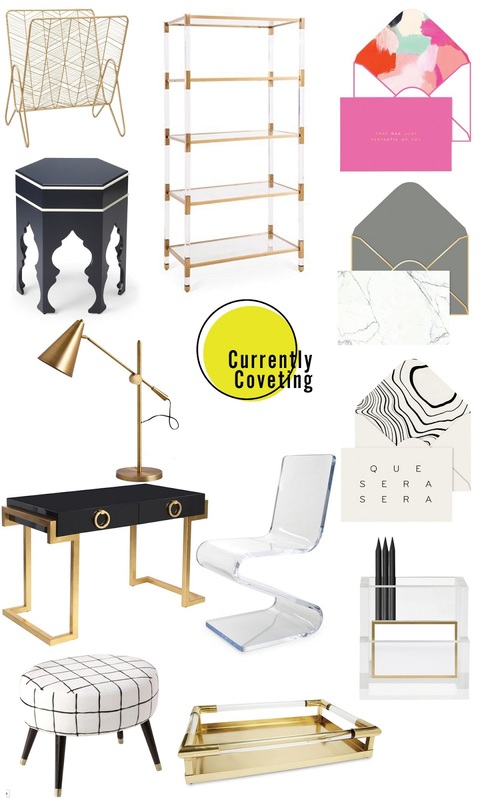 What are you currently coveting for your office lately? I wish I could have a desk with all these beauties!!! All of these in an office would be surely divine!